The iPad is the perfect device for photos: being very similar to a digital frame, it's no surprise that most of the people I know have asked me to show off pictures on it, because it feels natural and well fitted on that large surface. Considering that Apple also introduced support for much of the goodness avaialable in iPhoto such as Places and Events, it's clear that experiencing photos was one of the first features that came to Steve's mind when the iPad was still a sketch. When you go online though, your photos are on Flickr. Sure there are a bunch of other services to browse and archives photos (Picasa, MobileMe) but if you're really serious about your collection you open an Flickr Pro account. Period. 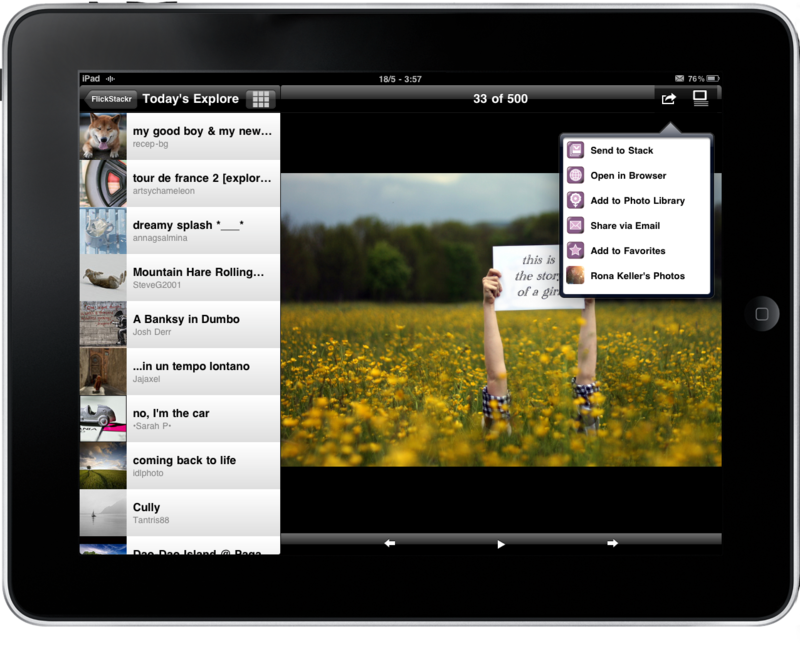 Now think about what's in between: a great Flickr app for the iPad. While we're still waiting for Mike Bernardo to announce his plans for a new version of Flickit, FlickStackr for the iPad is where it's at. FlickStackr is available at $0.99 in the App Store, but it's worth so much more. 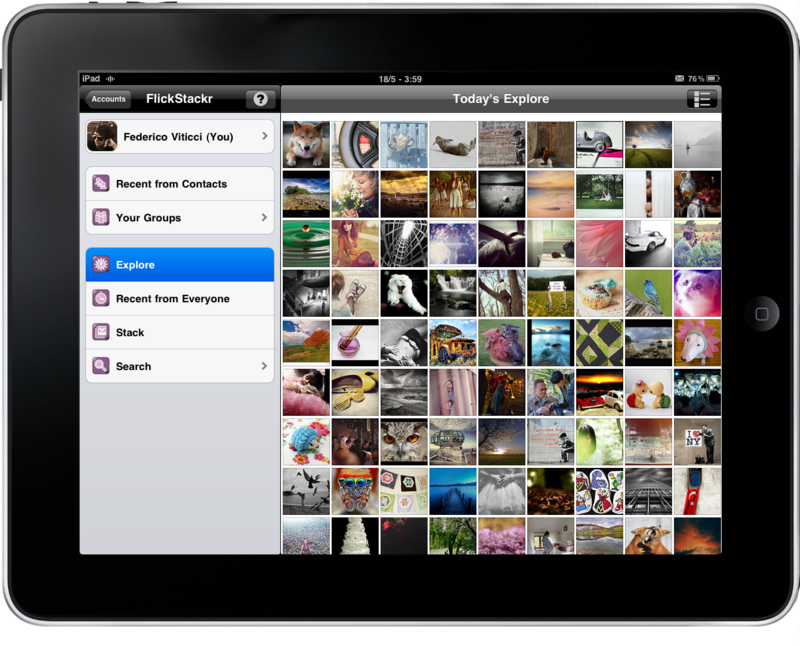 This application is hands on the best and most complete way to enjoy browsing Flickr from your iPad right now. It allows you look at your own photostream, sets, favorites and contacts, browse the Flickr Explore section and search for anything you like. It's a powerful app that does a lot of things in a good interface design. First and foremost, you can use the app whether you have a Flickr account or not. If you just want to browse photos and people, that's fine. I have a Pro account though, and setting the application up to access my account was easy and fast: once you try to configure your account you'll be presented a web view of the Yahoo sign in page where you have to enter your username and password and authorize the app. I have to admit I used 1Password for this. You can also setup multiple accounts. Once authorized, the web view will jump back to the app in seconds. FlickStackr relies on the usual split view / popover when switching from landscape to portrait mode, but I use the app in landscape mode because it's just better to look at photos on this orientation. There are a bunch of icons in the sidebar, which you can use to browse your account, search, look at Explore, see recent photos form everyone and access your stack. The stack is one of the most important features of the app (and the one that gives it this name) and you have to think of it as a place where you save photos you don't know what to do with yet. These photos are cached locally on your iPad so that you can review them later without publishing them on Flickr. I found it pretty useful for, say, browsing wallpapers and choose later the ones to save in the Photo Library. Navigation is what really got my attention. When you start from, say, the Explore icon in the sidebar, photos are located in the right panel as a list, but you can switch to a thumbnail view by using a button in the top right. As you tap on a thumbnail, the right panel slides to become the sidebar (keeping the view you chose) and the single photo goes on the right. Touch it, and it slides again to go fullscreen. It's beautiful and intuitive. When you're looking at a photo you can also switch to another view that lets you check further info, comments, tags and Exif for the picture. I don't like the design here, but the functionality is great. Like I said, FlickStackr is the bestbway to browse Flickr from an iPad. The next update, available on May 25th, will bring support for uploads with geotagging, full offline mode and enhanced sharing features, and we can't wait. If you love Flickr as much as I do you'd be crazy to not our chase this. Also, it's a universal app. You have no excuses to miss FlickStackr.